The low-cost chain has rapidly expanded and will soon open its first branch in Cork. FITNESS FANATICS HAVE felt the burn from high health-club membership fees, helping budget chains like Flyefit muscle their way into the multimillion-euro gym market. Newly filed accounts for the fast-growing Dublin firm highlight the very-lucrative business of running a low-cost operation. Company documents show that Flyefit recorded revenues of €11.2 million last year, up 2016′s €8.7 million turnover. Profits grew €1.2 million to €2.8 million during the 12-month period, pushing the accumulated sum to nearly €6 million. Earlier this month, Flyefit announced the January 2019 opening of three new gyms, at Liffey Valley and Sallynoggin in Dublin and Oliver Plunkett Street in Cork, the first location outside the capital. The company said that it is investing €6 million in the latest expansion programme. Flyefit currently operates 11 gyms in Dublin, three of which opened this year alone – at the CHQ building in the city’s docklands, Stillorgan and Tallaght. The company is co-owned by Brendan O’Hagan and Sé Kennedy, who received directors remuneration of €489,600 in 2017. The gym chain employed an average of 35 people last year, down from 50 after it roughly halved its production and sales staff. Flyefit declined to comment on its accounts or further expansion plans when contacted through a spokesman. A 2018 report by professional services firm Deloitte and not-for-profit EuropeActive ranked Flyefit as the sixth largest gym chain in Ireland based on the number of clubs it operates. The latest expansion will likely propel the group to the top of the league, overtaking Club Vitae which currently runs 12 outlets in the Republic, although it has plans for two more. According to the same report, around 500,000 people in Ireland are members of a fitness club. With an average of 704 members per outlet, the country has one of the lowest members-club ratios in Europe, although this may be due to the generally low average membership at independently-owned facilities, which account for 80% of the overall customer base. The fitness industry in Ireland generated almost €300 million in total annual sales last year, according to the Deloitte-EuropeActive study, up from 2015′s tally of €230 million. The average membership fee here is a little over €49, above the European average of €39.30, making Ireland the most expensive country for gym memberships in the EU. High averaged membership fees have paved the way for low-cost operators like Flyefit, which charges a minimum membership fee of €29 per month, giving punters access to the gym’s facilities and ‘free’ classes hosted by self-employed personal trainers. 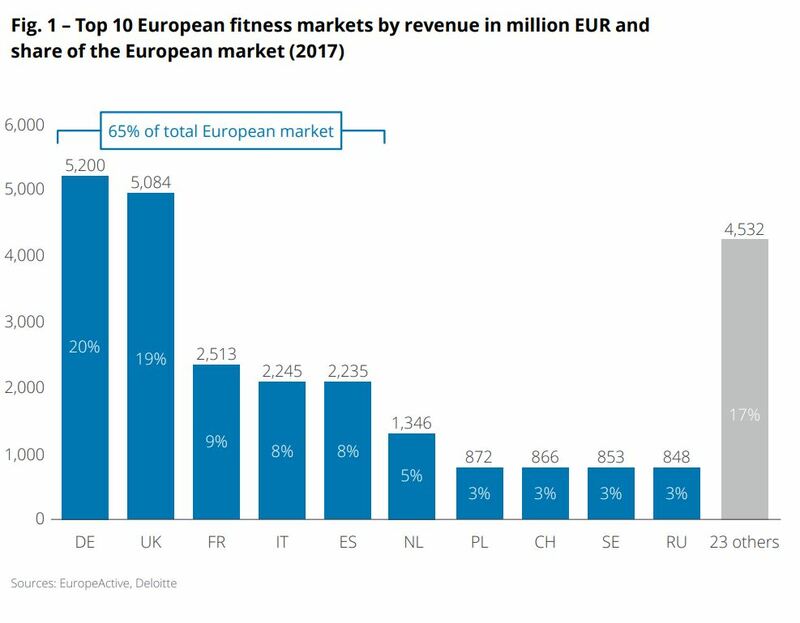 According to the Deloitte-EuropeActive report, Europe is the largest fitness market in the world, with a total market volume of about €26.6 billion. The report said health and fitness clubs remain a “highly attractive” investment opportunity, noting that there were some 20 major mergers and acquisitions in the industry last year, the highest ever since the annual study was first launched five years ago.